Consider, if you will, the social history of blue jeans. I would quote from those articles, but the computer I’m using won’t let me do that for some reason. You’ll have to read them for yourself. I remember the 1970s, when blue jeans were considered the ultimate rebellion against any kind of social hierarchy. It was cool to wear blue jeans, but especially cool if one was rich, smart, female, good looking or popular. When exceptional people wore blue jeans, it signified that their exceptionalism was so obvious it didn’t need any external support. The blue jeans statement was “I’m so cool I don’t need to prove anything by wearing better clothes”. Suddenly everyone was in blue jeans – entertainers, politicians, school teachers, and CEOs. Nowadays, of course, most people who wear blue jeans aren’t making any kind of statement. They just dress according to prevailing social expectations. It is much the same with other trends. The tattoos you see on female ankles today started among strippers. The earrings you see on men started among homosexuals cruising the bars. The baggy pants on boys started among prison inmates. So, whereas culture used to flow from the top down, modern culture flows from the bottom up. Trends that had their origins in the sewer end up becoming mainstream. It is therefore worth exploring what it is about blue jeans that made them such a symbol of rebellion in the first place. My grandfather was a solider, a cop, a farmer, a hunter, and a fisherman – a man’s man, if there ever was one – and I never once saw him wearing a pair of jeans. I don’t own a pair of jeans myself. My boys wear blue jeans sometimes because they are rugged enough for rough play, good for wearing around the ranch, and (importantly) affordable. Jeans were justifiably popular among gold miners because of their famous durability. They do have their place. But I wonder if grown men shouldn’t rebel against the rebellion, so to speak, and return to wearing clothes which are better suited to the dignity of their work, their leisure, and their station in life. Every year, the historic Patrick Ranch in Durham hosts an old-fashioned Country Faire and Threshing Bee for two days. For the past three years our kids have played their bluegrass and folk music at this event with some of their fellow students in the area. This year it was just “Freedom Hill” – our children and those of another Catholic family – playing on the flat bed of an old farm truck. There are several close-knit Mennonite communities in this area, and every year we see some of them at Patrick Ranch. They are typically farmers, and the Country Faire has lots of things of interest to farmers – especially farmers who prefer the old ways. The Mennonites are easily recognizable by their distinctive dress, large families, and respectful behavior. Our girls take notice because the Mennonite ladies also dress in a feminine and modest way. As it happens, I was standing in the hot dog line behind one of these families – a young man, maybe thirty to thirty-five years old, with his wife and two very small children. He complimented me on the performance (as if I had anything to do with it! ), and we struck up a very friendly conversation. I told him how much we appreciated seeing them at these events, and how they set a good example of family life for my own children. I spoke with his wife for a few minutes as well, and she told me about the music training all the Mennonite children receive. (They do not play instruments but are taught to sing and read music at an early age.) We then got our lunch and went our own way. About 30 minutes later, after we had eaten, this same gentleman walked up and wanted to introduce his grandparents. The grandfather looked every bit the part of a Mennonite patriarch with 33 grandchildren. He had many kind things to say about the Freedom Hill children, whose performance he had also heard, and asked me to contact him and let him know when the next performance would be. After talking a little while longer and finding even more common ground, he invited us to play music at their family home in exchange for a meal, promising me that his wife (who was standing beside him) is an excellent cook! And so, two traditional Catholic families and one large Mennonite family will soon be getting to know each other. I have always respected and admired these people – from a distance, of course – and am quite humbled by this warm and spontaneous invitation. It should be a very interesting encounter. I pray that we, at least, will be as much a credit to our Catholic Faith as they are to their own. “What is there to say about the great purity of soul with which the saints managed to receive the Bread of Angels? We know that they had a great delicacy of conscience which was truly angelic. Aware of their own wretchedness, they tried to present themselves to Jesus ‘holy and immaculate’ (Eph 1.14), repeating with the publican, ‘O God, be merciful to me, a sinner’ (Lk 18.13), and having recourse with great care to the cleansing of Confession. ‘Approach the Sacred Banquet,’ said St. John Baptist de La Salle, ‘with the same dispositions that you would desire to have in order to enter Heaven. One should have no less respect in receiving Jesus than in being received by Him’. When St. Jerome was brought Holy Viaticum at the end of his life, the Saint prostrated himself on the ground in adoration, and he was heard to repeat with profound humility the words of St. Elizabeth and those of St. Peter, ‘How is this, that my Lord should come to me?’ and ‘Depart from me, for I am a sinful man, O Lord’. And how many times was the angelic and seraphic St. Gemma tempted not to receive Holy Communion, considering herself to be nothing else than a vile ‘dunghill’? 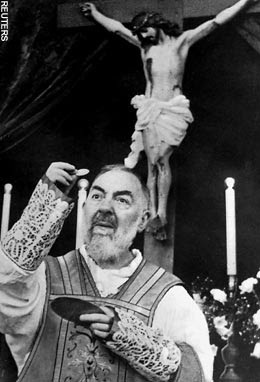 (St.) Padre Pio of Pietrelcina used to repeat with trepidation to his brethren, ‘God sees stains even in the angels. What must he see in me!’ For this reason he was very diligent in making his sacramental confessions. So too St. Teresa of Jesus, when she was aware of having committed the least venial sin, would never receive Holy Communion without first going to Confession. – Fr. Stefano M. Manelli, F.F.I.